In the Colca Valley (Caňon del Río Colca), you will discover traditional Peru with breathtaking landscape, see llamas, alpacas and condors and you can visit the second deepest canyon in the world. 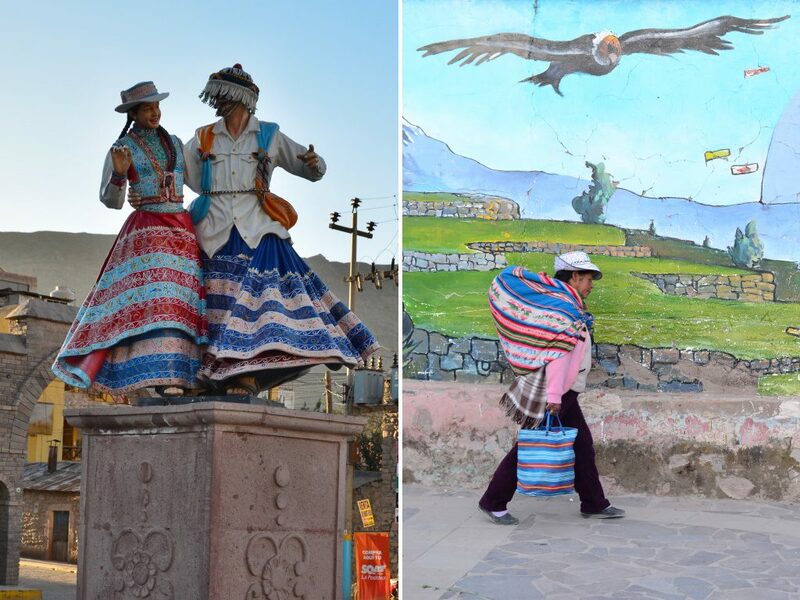 I spent fabulous 2 days in Colca Valley and in this post, I would like to give you an idea of what to expect from Colca Valley and why to put it into your list when visiting Peru – either as a 3 or 4 days´ trek or 2 days´ cultural trip. The Colca Valley is accessible from Arequipa, second largest city of Peru. 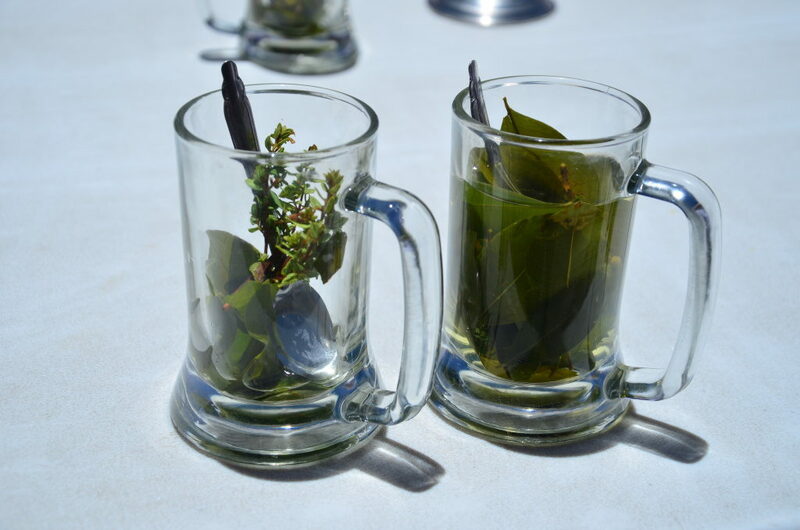 There are several agencies in Arequipa organizing treks and cultural trips to Colca Valley. We had a great experience with Carlos Zárate Aventuras – they offer treks to Colca Valley (count between 3-4 days least, a 2-day trek is also possible, but you will need to leave at 2:30 a.m.!) or the cultural trip for 2 days (the one we did). The price then depends on the type of the trip and selected accommodation (from basic hostels to more comfortable places). If you prefer, you can also rent a car and go on your own. You can find some accommodation in Chivay. The first day in the morning, a minibus with a guide picked us up at the hotel. I couldn´t help myself stop staring at the driver who was constantly chewing coca leafs, holding a pack in his hands while driving. We had a good guide that talked a lot and said many interesting facts not only about the Colca Valley but also about Arequipa and its surroundings. Before leaving Arequipa, we stopped at the petrol station and got some bottles of water plus (very important) coca leafs and caramels. 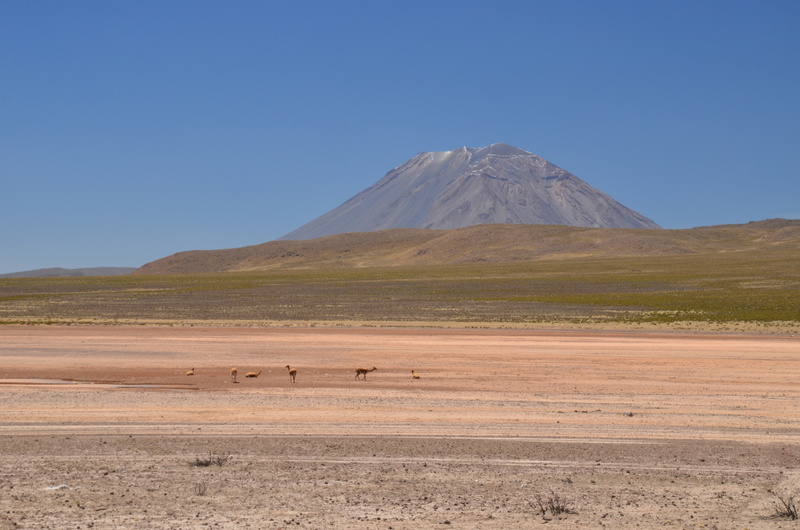 Then we left Arequipa and crossed the Natural Reserve Aguadas y Salina Blanca direction to Chivay, a small village from where a lot of treks start, and where we had our 1-night accommodation arranged. This is the second most important natural reserve in Peru. 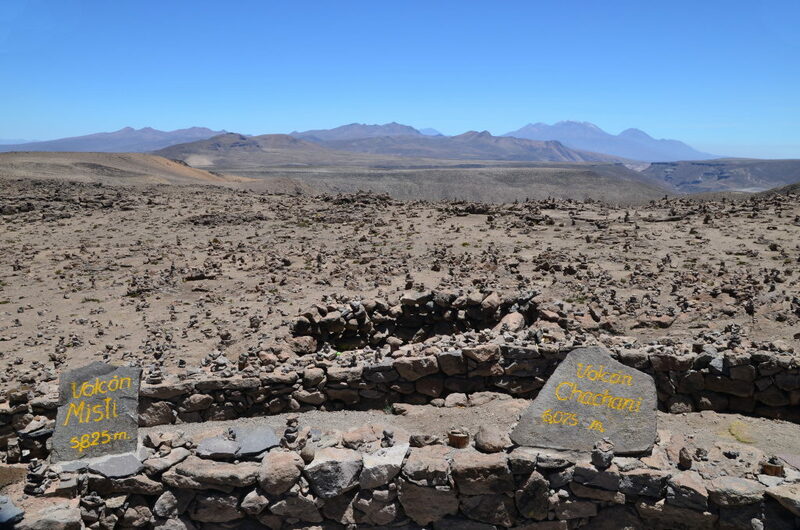 An area of 7.400 square km is covered with many endemic plants such as the yellow grass that is unique to Peru, Bolivia, and Chile and which is a favorite meal of llama and alpacas, but the locals also build roofs from it or use it for rituals. Another about 400 plants grown here are used in medicine. Many animals live here too: pumas, chinchillas, condors, flamingos, llamas and alpacas. The higher we get, the deeper blue sky is and the more alpacas, llamas and vicuňas we see around. There are 150,000 vicuňas in the South America, out of which 80% live in Peru and 3,000 only in this reserve. With their elegant movements, big and dark eyes, they are such a cuties! Vicuňas live in groups in order to protect themselves from pumas and foxes. 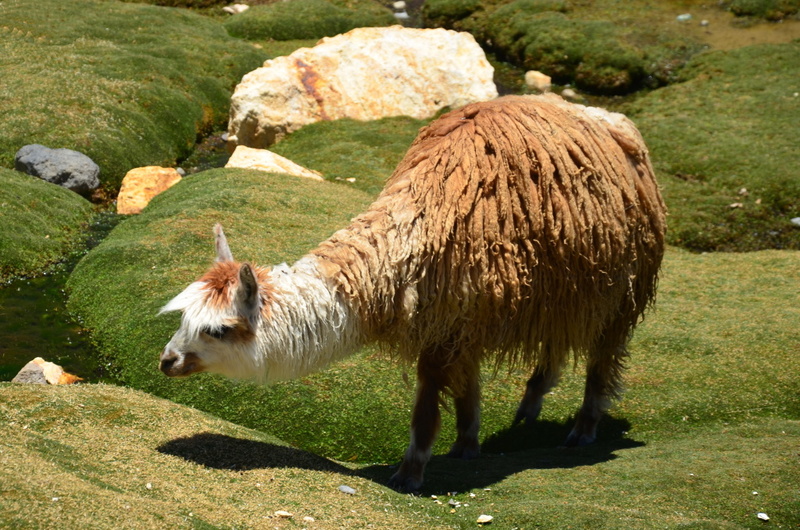 There are 4 million of alpacas in Peru. They came originally from the North America and were domesticated. First around the Colca Canyon and Lake Titicaca. During the times of colonization, the alpacas started to live together with llamas and mix between them. The result of this is for example alpaca Bob Marley on the below picture 🙂 . The percentage of pure alpacas in Peru today is only 20%. Patapampa pass was the highest point of our journey from Arequipa to Chivay (4,910 m above the sea level), from where we could see about 6 volcanoes surrounding the city of Arequipa. The highest ones have around 6,400 m. We got off the minibus and had a walk to see better the volcanoes and take some pictures. Respect to nature. Respect to all the people living in Arequipa, as in case the Misti volcano erupts, 90% of the white city is gone. After few minutes out, we started to have a headache that got stronger upon our descend to Chivay (from nearly 5,000 m to 3,600 m) in an hour. 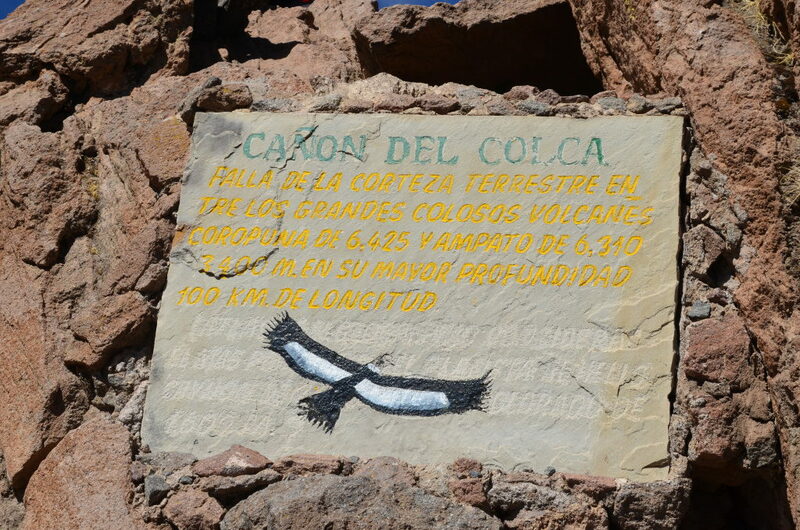 In the Colca Valley, there are about 16 villages founded in the time of colonization. Approximately 22,000 inhabitants speaking different languages (Quechua, Aymara). Despite the early arrival of conquistadors in 1538, people still live here the traditional way of life, cultivating their crops on the pre-Inca terraces, and the villages, therefore show the true face of Peru. Chivay is a beautiful village ready for tourism. On the main square, there is a colonial church and a small park, surrounded by some restaurants and entry to a market where the locals sell their vegetables, fruit, homemade food and hand-made clothes and other crafts. The village is nicely decorated with flowers and several statues of dancers in their traditional dress. Chivay is known for their hot springs, so if you have time, get some relax in these. After the dinner, we also tried some of the traditional dance from Colca Valley. It was fun. The other day in the morning, we passed through Yanquie village where every year Fiesta del Amor is organized. 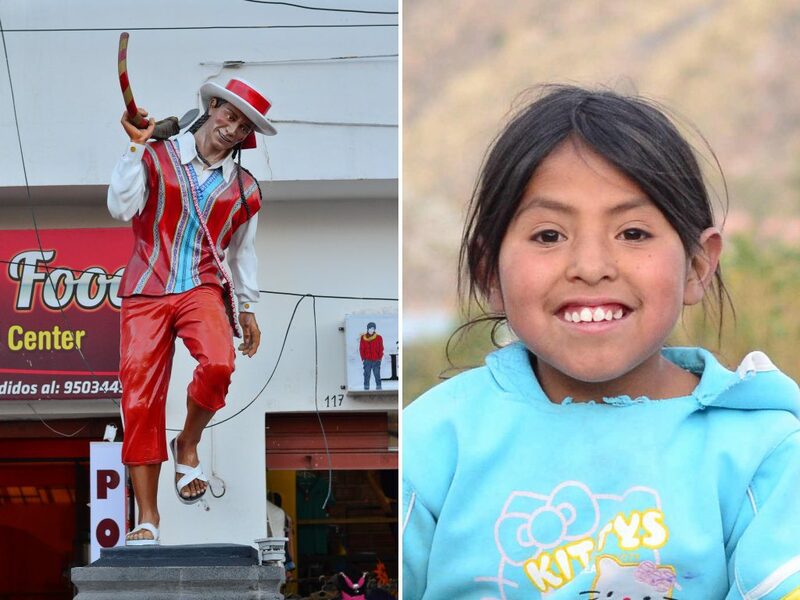 It is the most important and famous festival of the Colca Valley that takes 4-5 days in total. Every morning with the arrival of tourists, some dancers in traditional dress are ready to show them some short demonstration. Maca is a tiny village with 700 inhabitants and frequent earthquakes. Again we were welcomed by local women offering us to play with their llamas or eagles, or take a picture of them for a small fee. About 14.000 ha of pre-Inca terraces are still part of the region today. Every level has its own microclimate and so different crop is grown on each level. The most frequent crops here are potatoes, corn, beans and quinoa and there are so many types of these in Peru! Finally, we arrived in the the Colca Canyon, which is the second deepest canyon in the world (3,400 m in the deepest point, which makes it twice deeper than the Grand Canyon in the USA!). We had about 2 hours here to have a walk around the canyon and see the condors that live here. Approximately 50 condors live in the canyon, and tourists come here to see them. Sometimes, if you have a chance, you can see them from a close distance, but we did not have that luck. After 1 hour of careful observation with binoculars in our hands, we saw only 3 and from a long distance. The condors can fly up to 7,000 m above the sea level and they sleep in the caves. The young ones stay in the nest up to the age of 1.5 years. At the age of 7, they are adults and we can recognize it according to the white collar and their wings span of more than 3 m. Then we took a walk around the canyon and waiting for the 47 other condors to show up, but without success. There are also villages in the canyon with about 2,000 people living there. The electricity and phone have been set up in these villages only 2 years ago. People live from what they produce and sell in Chivay and other neighboring villages, mules ,and llamas are used to transport the goods. 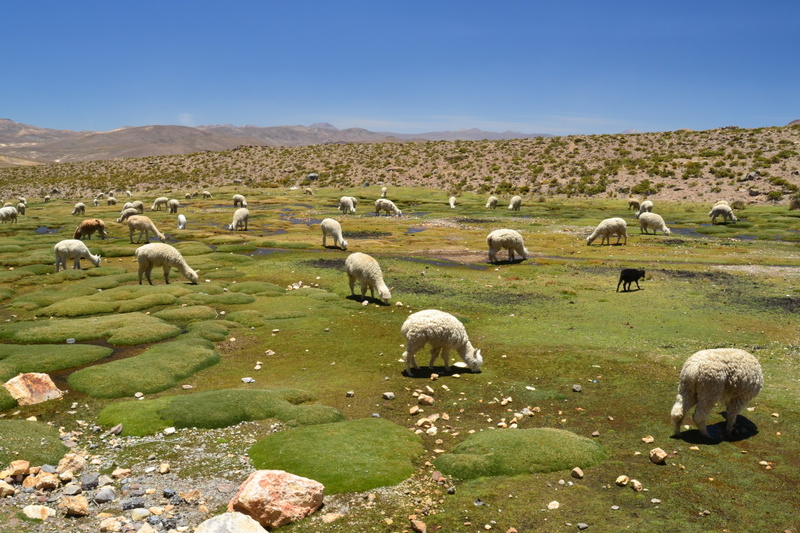 Have you been to Colca Valley? Did you do the trek? Let me and other readers know how was it in the comments below!